Going into the 2014 football season, we all know that Clint Trickett is the starting QB. The question now becomes, who will his back-up or back-ups be? Let us take a look at each of the quarterbacks that are currently on the roster. Storm McPherson was definitely the most accurate passer during the passing drills this spring, but we never saw him under center. This leaves us with many unknowns about him, and we can pretty much eliminate him from the back-up competition. This leaves the following QBs: Paul Millard, Logan Moore, Skyler Howard, and the freshman, William Crest. (8) The ability to adjust the tempo to the game. He has to be the leader on the field. Paul Millard: This is his 4th season in Holgorsen’s offense and it would make sense that he is the most knowledgeable about this offense and how it operates. But can Millard effectively run the offense and do all the things listed above? Logan Moore: During the spring practices, Moore was able to do more of what Trickett does than Millard or Howard. The question with Moore is, how much has he improved since the spring and is he ready to run the offense? Skyler Howard: Howard looked completely out of sync with the offense during the spring, but he did make a couple of good runs. Watching video on Howard, he appears to have many of the same skills as Trickett. The one big issue with Howard is his height for he is the shortest of the QBs, coming in under 6-feet. The spring drills ended in April and the players have been working on their timing since then. Fans and analysts alike have been unable to see any of the improvements he has made. During the spring practices Howard looked like he really needed to be red-shirted. His timing was way off, and he was late moving the pocket. WVU’s defense was able to put lots of pressure on him. The question now becomes; how much progress has he made since then? Could he run the offense? William Crest: Wasn’t available for spring practice since he was still in high school. He arrived on campus in June, and immediately entered into the QB completion. 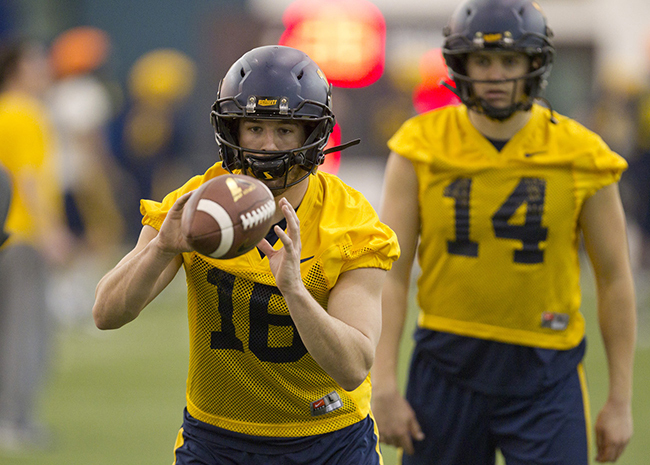 Trickett was named the starter, and Crest entered the back-up QB competition. We all know that it takes a while to get acclimated to Holgorsen’s offense. We haven’t heard or seen anything about Crest, so for the fans and sports analysts, Crest is basically an unknown commodity. All we have are his high school highlight films. Going by the videos, Crest’s playing style fits into Holgorsen’s offense and is similar to Trickett’s. The other big question is: What about the 2015 season? Will Holgorsen want to use Crest as 2nd back-up going into the 2014 season to get him acclimated to Big XII football and opponents like Alabama? Would he do this hoping that by mid-season Crest is ready to take over the back-up position in preparation for the 2015 season? Has Howard shown enough to be Trickett’s back-up and can the progress he has made since the spring help motivate and move Crest forward. You can bet that Holgorsen will have two backup QBs behind Trickett, and he needs to have back-ups that can come in play very similar to Trickett for offensive consistency. Millard coming in means the most change to the offense and presents many issues, the key one is the blocking by the OL and the routes run by the offensive backfield. These are major changes and can have a very negative effect on the overall play of the offense, as adjustments will be required at most every offensive position. I have no clue as to who the back-ups will be, but I seriously doubt that Millard will be in the mix. If I were going by spring practice alone, my best guess would be Moore as No. 1 and Crest as the No. 2 back-up. But like fans and sports analyst, I haven’t seen anything since April, and we all know how things can change in sports. It could end-up that Howard is the No. 1 back-up and Crest is No. 2, as a way to prepare them for the 2015 season. It will be interesting to see how all this shakes out. This entry was posted in George O'Bryan, Home and tagged Featured, Logan Moore, Paul Millard, Skyler Howard, William Crest, WVU Football. Bookmark the permalink. ← Clint Trickett Is the New Sheriff At WVU!